Join Seed to Table as we celebrate the bounty and success of this season. Located in a beautiful pasture, you will have the opportunity to enjoy a world class, four course meal by award winning chef, Anna Witham. The evening will start off at 4:30 with the opportunity to take a tour of the beautiful farm, take in the music of the Melanie Rose Dyer Trio and enjoy farm fresh appetizers. This is a unique farm to table event. 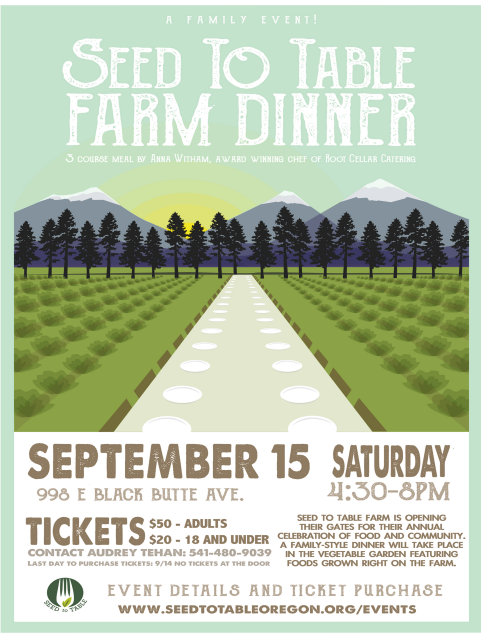 It is our one event of the year where we turn the pasture into a magical long table dinner. Address: 998 E Black Butte Avenue, parking available in the vacant lots. Signs will help direct your. Hope to see you at the table. ** Meal features Splitting Aces Grass Fed Beef as main course. However there are plenty of vegetables to choose from if you prefer a vegetarian meal. Family style meal.